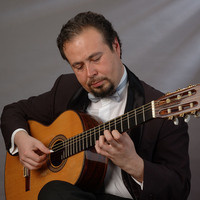 Romilio Orellana was born in Santiago, Chile and studied guitar with Professor Ernesto Quezada, graduating with honours from the Faculty of Arts at the University of Chile. He has participated in masterclasses with celebrated players such as Hopkinson Smiths and Eduardo Eguez. For five consecutive years, he won the "Friends of the Municipal Theatre" scholarship presented to the most promising young talents in Chile. He has won many first prizes in International Guitar competitions including in Benicassim in Spain. Romilio has appeared at several prestigious international festivals around the world: Expolisboa '98; Hanover International Book Festival, Guadalajara, Mexico and the 50th Anniversary of the King of Thailand Celebration. He is regularly to be seen touring as a recitalist in Argentina, Venezuela, Mexico, Spain, Germany, Switzerland, Russia,Portugal and Thailand.